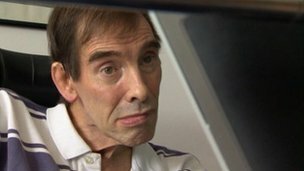 Locked-in syndrome sufferer Tony Nicklinson has lost his High Court battle for the legal right to end his life when he chooses with a doctor's help. A second victim of the syndrome referred to as "Martin", 47, who cannot be identified, also lost his challenge to the legal ban on assisted dying. Three judges sitting in London referred to their "terrible predicament" and described their cases as "deeply moving and tragic". Mr Nicklinson, 58, from Melksham, Wiltshire, was left paralysed by a catastrophic stroke while on a business trip to Athens in 2005. The court heard that he had been told his existence of "pure torture" could continue - if a doctor could not help end it - for another 20 years or more. But the judges unanimously agreed that it would be wrong for the court to depart from the long-established legal position that "voluntary euthanasia is murder, however understandable the motives may be". Doctors and solicitors who encouraged or assisted another person to commit suicide were "at real risk of prosecution". Refusing the stricken men judicial review, the judges ruled that the current law did not breach human rights and it was for Parliament, not the courts, to decide whether it should be changed. Any changes would need "the most carefully structured safeguards which only Parliament can deliver". Lord Justice Toulson, sitting with Mr Justice Royce and Mrs Justice Macur, said both are tragic cases which raise constitutional issues and "present society with legal and ethical questions of the most difficult kind". After the ruling, Mr Nicklinson said in a statement issued by his lawyer: "I am devastated by the court's decision. Although I didn't want to raise my hopes; it happened anyway, because a fantastic amount of work went into my case and I thought that if the court saw me as I am, utterly miserable with my life, powerless to do anything about it because of my disability, then the judges would accept my reasoning that I do not want to carry on and should be able to have a dignified death. I am saddened that the law wants to condemn me to a life of increasing indignity and misery."